The contrast in appreciation of Leviticus and Numbers by the synagogue on the one hand, and by the church on the other, is little short of astonishing. The former has considered it crucial to an understanding of God and of the nature of the "chosen people" of Israel. The latter has usually reduced it to allegory or as a mere historical record of Israelite religion. 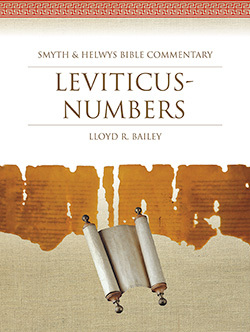 In this new volume, Hebrew Bible scholar Lloyd R. Bailey examines these often overlooked or under-appreciated books of Moses in the contexts of both the Jewish and Christian traditions. Lloyd R. Bailey, Sr., is a retired Professor of Hebrew Bible at the Divinity School, Duke University and now serves as Barrow Professor of Religion at Mount Olive College and as Adjunct Professor of Religion at Methodist College. He is a United Methodist Clergyman, author of fifteen books, more than seventy articles in encyclopedias and journals, has numerous television appearances in documenteries on the Bible, and has served as President of the Society of Biblical Literature.